Obsessed with Scrapbooking: Pumpkins, pumpkins, everywhere! On Sunday, I raced over to Michaels, where the fake pumpkins were 50% off plus I had a 20% off coupon also, good for the afternoon. 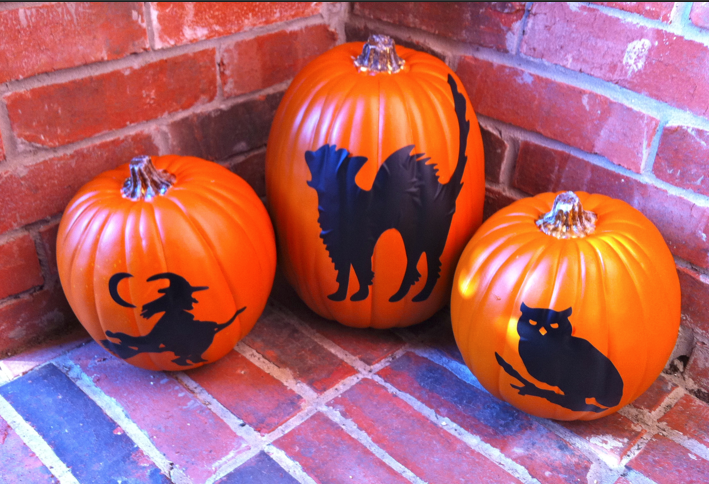 I have been planning to use vinyl on pumpkins for months so I was thrilled to get these! Now, this is not a project for the perfectionist because vinyl really doesn't like going around curves nicely. Add in the vertical lines on the pumpkin and it gets really hard. So, if you like things to be absolutely perfect, do not do this project - you will drive yourself crazy! 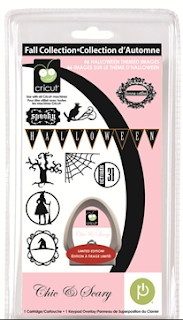 I used images from the new Cricut Seasonal Cartridge Chic & Scary (retails around $24.99). These were easy to cut out using the blade at 3, pressure and speed also at 3. Because there were only a few areas that needed to have the vinyl removed (eyes on the owl, bits on the witch), it took no time to get the vinyl ready to adhere. I cut the witch using the flip button at 5". I cut the owl at 5" (no flipping) and the cat at 10". I tested everything out with black paper first to make sure I liked it since vinyl is more expensive. Now, to adhere it. I used the Provocraft transfer tape to lift the vinyl off its backing and from there carefully manuevered the images onto the flattest sides of the pumpkins that I could find. For the owl, I ended up taking the transfer tape off, once I had most of the owl down since it was easier to lay him down and smooth the vinyl out as I went. The cat was super tricky. Putting large vinyl images onto a rounded surface is tricky and the vinyl won't smooth down quite like you would like it. I considered not showing you guys this pumpkin, but figured, if you were going to try it yourself, you might as well know what the results could be. Finally, I promised my taco bean soup recipe! I got this from a Weight Watchers meeting and 1 cup = 2 points (old system of points). It is delicious! Put together in large soup pot. Bring to boil. Lower heat and simmer for 15 minutes. Enjoy! These are so cute!! My mom wanted me to cut something our with the cricut and use that as a stencil for carving the pumpkin but i think this is a much better idea!! That soup sounds so yummy!! 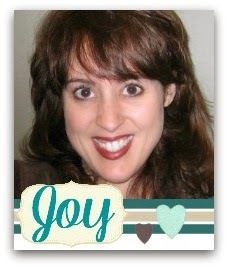 Your pumpkins are adorable, Joy! Great idea! Your pumpkins are adorable. 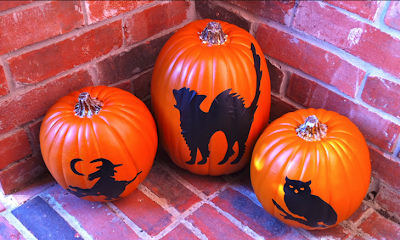 What a great idea and no mess from the carving! Love these. I just love vinyl and I know it's a bit tricky, but so worth it. Thanks for the inspiration! I love how these came out. So cute! I hate I missed the sale. I have wanted to try the vinyl on pumpkins this year. Very cute. Bet that makes a great display on the porch. Thanks for the taco soup recipe too. I'll have to try that very soon! Sounds yummy! These are wonderful. I like fake pumpkins because the squirrels don't eat them and make a mess. thanks for the recipe too. I love these and I love this cartridge...I didn't this was available! Thanks for the recipe! I love your pumpkins! I think I would go insane trying to adhere the vinyl onto the pumpkins, but thin is such a cute project and it turned out great I think I need to try it! Thanks so much for the inspiration! What a great idea! Something I can store away and use every year! Thanks so much! Such greate ideas! I love the pumpkins! Thank you for sharing your creativity with us! Great idea!! Lots of use for years to come!! What a fun idea. I missed the sale but will pick up one with my 40% off coupon. Thank you so much for the soup recipe. I can hardly wait to try it. Love the pumpkins! They look great to me, you must be a person with loads of patience. Thank you for the Taco bean recipe. It sounds really good. So, love it. In fact, that is exactly what we did over the weekend. Went to a scrap retreat and we headed to michaels bought some pumpkins and cut vinyl and decorated w/flowers, bling, and we got crazy. I will share my pumpkins too. I had trouble w/the Chic and Scray w/gypsy though, didn't work. I had to use happy hauntings on mine. Provocraft is working on the issue w/gypsy and new cart - ugh. Yummy,I just made the Taco Soup! Thanks for the recipe! I can't wait to try vinyl. 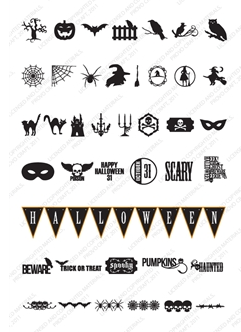 I am going to attempt to do some halloween decorations for a big mirror over my couch and my front door! Great idea! An excellent alternative to carving pumpkins, which gets pretty messy at times. CLEVER!!! I would never have thought of doing that! Love visiting your blog! Recipe looks yummy! 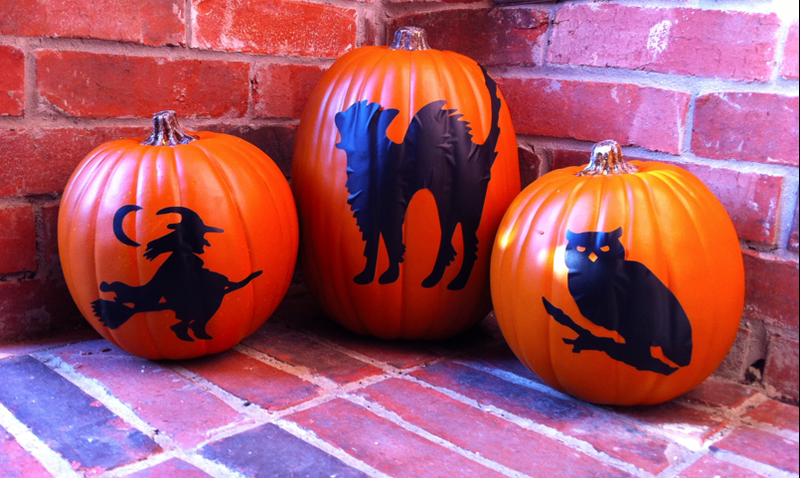 I love these pumpkins! Way neater than carving them LOL! Amazing what you can do with pumpkins. We love eating them here and making pumpkins soup. Thanks for showing us the pumpkins- very cool! The soup sounds delicious too! What a cute idea this is! I would love to have cute pumpkins that don't go bad right away!!! Great project idea thanks for sharing. Your pumpkins are super cute!!! Quit worrying about the vinyl bumps...I understand why you explained it...perfectionists would be crazy...but most people wouldn't notice the bumps and they are really, really cute!! Oh - for cryin-out-loud! 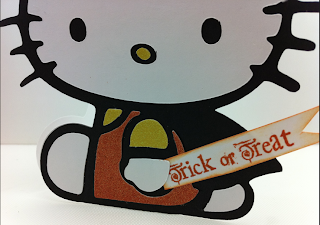 This card is so stinking cute! I will have to get the cartridge just for my daughter. Super pumpkins. Who cares if everything isn't perfect! It looks great to me. The pumpkins look great! I am one of those perfectionists, but these really do look good! Cute pumpkins, the vinyl looks great from here lol you really have patience to persevere as I would probably have given up! The pumpkins look great! And they can be used year after year. The soup recipe is a must try in this house hold, it sounds delicious! Love your pumpkins! I love working with vinyl and having your DVD to refer to makes it so easy! Hmmm. Might have to finally try vinyl! Love this cartridge. So many ideas! I am in awe of your creativity. I don't know how you do it all. This looks like another must have cartridge...love the Halloween banner. Thanks for the recipe, too. Sounds like a great one for taking to work. Those pumpkins are awesome. I think you have blended everything so beautifully. Thank you for sharing. Thank you for the chance to win a wonderful cartridge. Your soup recipe sounds very good.